28Kms. I type again 28kms. This was a huge run for me. Unbelievably huge, considering I went 28kms two weeks ago and ended up dehydrated and useless for the rest of the day. You never read that post? Not surprised, considering that since that run I haven’t posted a thing. Two weeks ago, I learned the difference in going for a run and training for a marathon. I ran without enough sleep, without a hydration plan, having gorged on salty foods the night before. I left a t 6:00 and ended up finishing my trek at 10:45, having walked about 6-8 kms. It was hard, it was demoralizing, it nearly did me in. It didn’t, after thinking about my failure to plan I was determined to do it right at the next opportunity. The following two weeks included runs from 8-12 kms, no really big plan needed for those. Then came today. I had made some adjustments to my thinking after talking to some established runners. The biggest, is that it is okay to walk. Until now I was stuck on the belief that walking was failing. I had done 22 kms without walking so that had further reinforced the silly notion. My run broke down like this. The first 9 kms took me to the Tiger Express on Northriver Rd. Then I picked up a bottle of water and walked one km. Then ran down to the Queen Charlotte Armoury where I picked up the banana and Gatorade. Then ran to where I had stashed the second half of my water bottle, ran to the Tiger Express where I walked 1 KM. After that it was the last 8 km run. This worked really well for me. It allowed me to finish in less than 3.5 hours! Compared to my poorly planned run which I finished in close to 5 hours! 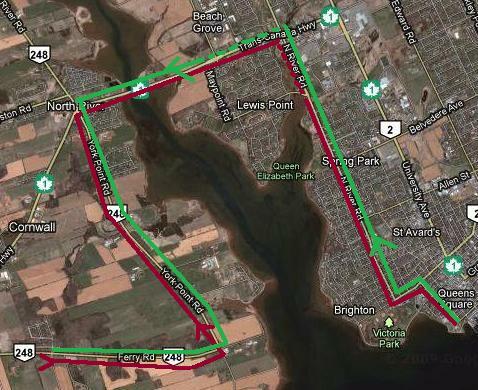 Below is my route, with highlighted walking area. This entry was posted in Long Runs, Marathon and tagged hydration, long run, walking. Bookmark the permalink. 7 Responses to 28 Kms! Totally impressive and inspiring. Well planned is half done. Great job! I can’t wait to train for my marathon someday 🙂 I have a hand-held bottle that has a strap that goes around the outside my hand so i really don’t have to hold onto it. I never run without it!! Amazing accomplishment. I’m both humbled and jealous. Great work! It’s impressive looking at that map and how far you ran! Thanks for the comments fellow runners! With my new run 9 walk 1 I feel kinda unstoppable. At least until the next long run over 30 kms! They’re great about water and nutrition stations. You’ll never want for anything – every couple of stations there are nutrition stations with oranges, bananas and gel packs. There’s also a ton of bathroom facilities and people cheering you on. It’s such a beautiful place for a marathon. I am starting to get excited for it.